In lieu of the fact that tomorrow is miscarriage awareness day, and my dear "sister" Heather from Golden Reflections is also sharing her story, I thought I would also offer both my support to her, as well as to the countless others out there and share my story with you. I was laying on the couch one evening watching a real gripper of a movie when I felt some strange cramps in my stomach. At first I thought nothing of them, after all, the movie was one that your stomach just sort of knotted up in suspense with. I can’t even remember the movie’s title. Strange, But I do know that as the evening progressed, the cramps became more noticeable and I began to fear. You see, I had recently discovered that I was pregnant with our second child. Since our first was not even a year old yet, I was pretty shocked and didn’t quite know what to make of it. I was scared, and yet after the shock wore off I embraced the whole idea and began to get excited about the new life growing inside of me. However, on this particular night in July, I knew that something was not right. All night long I cramped and spotted and had that sickening feeling of dread. By morning, the pain was so intense that I honestly felt like I was in labor. I tried sitting in the bathtub to ease the pain, but it didn’t help much. I was doubled over from the pain. I cried. I remember Mike trying to comfort me, but honestly, nothing could at this point. I was losing my baby and there was nothing I could do about it. I was only 6 or 7 weeks pregnant and yet it was all so real, almost as if I had been expecting this baby forever. Midday, the pain began to subside and I almost thought to hope that perhaps everything was fine after all. But it was not to be. Around 2:00, I passed a tiny little sack that held whatever contents there were of my baby. And my life will never be the same. I have lost something very real. A baby. Oh, many will argue and say things like, “oh, you weren’t too far along” and “there was probably something wrong with it and that’s why your body rid itself of it.” Or, “God knows best.” But to be truthful, those comments stung. They really did. I know that people really don’t know what to say unless they have been there themselves, and that’s what I would tell myself. But the comments still hurt. The crazy thing is that we hadn’t told anyone that I was pregnant. So therefore, anyone we told that we had had a miscarriage to was completely shocked by the news. Probably partly why they didn’t know how to respond! But this brings me to an important point. 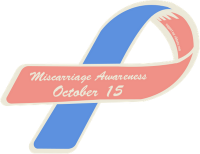 After I felt a bit more at ease to share about my miscarriage, I began to hear countless stories of women who had gone through the same thing. No, not all in the same way, but they had miscarried just the same. There are a whole lot of women out there who have gone through this kind of pain and yet have never shared it with anyone, almost as if it is something to be ashamed of or to hide. But it’s not. It’s a real grief. Shortly after this time, my husband and I both knew that we wanted another baby. We saw that children were a big gift from God, not to be taken lightly. A healthy pregnancy is truly a blessing. A few months later, we were blessed with another pregnancy and this one continued full term (and then some) and we were abundantly blessed with a little boy. But was he our second child, or our third? *smile* Outwardly, he’s our second, but I suppose in our hearts, he is our third, because someday, in the earth made new, I plan on raising that little baby who never had a chance to live. I will raise that child in a beautiful place called Heaven, a perfect place with no sin or sorrow. And no more miscarried pregnancies. I just want to encourage you ladies, to share with each other. There is strength in community, and a miscarriage isn’t something that has to be hidden away and quieted. It’s a real thing and there’s real emotion. Dare to share. Oh Sarah, I didn't know about this. :( I haven't experienced a miscarriage, so I can't empathize in the same way as someone who has. But thanks for sharing the feelings and the hurt. Heaven will be that much more wonderful, won't it? Thank you so much for sharing your story dear sis! There is strength in numbers. Although I hope no one has to go through what we went through. It is comforting to know that we are not alone though. Love you! What a heartfelt post! I've not miscarried, but several people dear to my heart have, and knowing how to respond is hard...I just know it breaks my heart when it happens to them so I can only imagine how it breaks the heart of the mother and father! I'm so greatful for that hope of an earth made new, where all the little ones who were, but never were, will be raised in a life so perfect, with no tears or pain!